Make War Not Love is a three-way strategy game throwdown between Company of Heroes 2, Total War: Attila, and Warhammer 40,000: Dawn of War 2 to see which of them can ring up the most players between February 14 and February 20. (The competition starts and ends at 10.00 AM PST.) 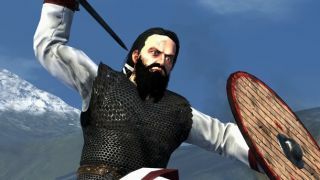 Prizes will be awarded to the leading game every 48 hours, and at the end, the victor will claim the spoils in the form of “faction-specific digital content.” And if Total War: Attila comes out on top, Creative Assembly will make the upcoming Slavic Nations Culture Pack free for everyone. Total War: Attila will be on sale for 75 percent off during the contest (and is actually on sale now as part of the Steam Lunar New Year Sale), cutting the price to $11/£7.50. It will also be available to play for free from February 18 to February 20, if you want to give it a shot without over-committing. Win or lose, the Slavic Nations Culture Pack comes out on February 25. Find out more about how you'll get down in Slav-town at the Total War Wiki.